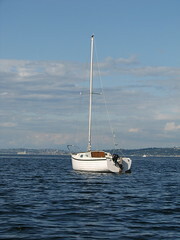 I have waited to give much detail about my 'new' sailboat until I was actually using it. It took me about a month to clean her up a little and get a mooring ready for her. Well, she's been in the water for about a week, and I have had the opportunity to sail her a couple of times, albeit in light wind. I really like the boat. I think it is just the upgrade to get Esther on the water more often, and take a few more cruises. The Montgomery 17 is 17' long (duh!) and about 7' wide. She weighs 1600 lbs. including 600 lbs. of ballast (weight underneath to keep it upright) This particular boat came with 5 sails, though I can only use two at a time. Each of the 4 'headsails' are for different wind conditions, from light air to storm. The rigging is much more sophisticated than my last boat, and I am 'learning the ropes' as I go. I am very grateful to have her, and I look forward to many years of nautical pleasure. Looks great! Beautiful sky behind as well! I've been wondering when we would see it on the water. Looks great!